I don’t have anything against Microsoft. Their software has its uses and while I do use Linux on my primary system and on all the servers I run/manage I also have windows XP on one of my systems and on my laptop and am happy with it as It doesn’t crash as often as earlier versions of windows and mostly does what I want it to do. Now that being said, lets move on to the topic of my rant. Could they have made the message any more vague? Can you figure out what it wants to update? I couldn’t and guess what this latest version of some Windows component was? What, No idea? It was Windows Genuine Advantage(WGA) verification tool. 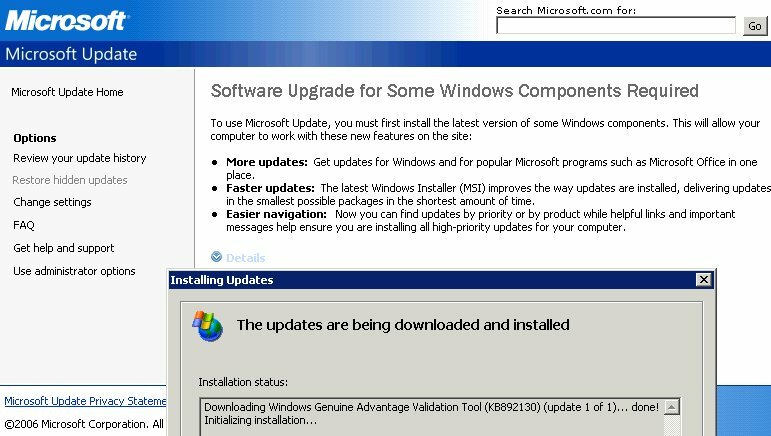 Now my question is, why couldn’t they just say that you need to install WGA verification tool before you download updates? Why did they have to be so vague? You know what the best part is? WGA is not a default part of windows, its a new software that MS is pushing out to detect pirated copies of windows, so doesn’t this make their message about it being the latest version of a windows component false and misleading? I have the same issue with other portions of MS update. They almost never tell what a particular update is for, I know they give the Knowledge Base number, but why can’t they tell you right over there exactly what issue a particular update fixes? Having that info over there would help me/other users decide if a particular patch needs to be installed immediately or can be installed later in a regularly scheduled update cycle. Well this is all from my side.